Love numbers? Here’s the March NetSquared stats. 96 events and 1,056 RSVPs. As usual we're growing fast! What's Next for the NetSquared Ambassadors? The NetSquared Ambassadors wrapped up their 2017 term on December 31. Their contributions continue to be a major part of NetSquared's success and growth because they give us local expertise and connections. I tried to measure their impact at the end of the previous year and the numbers continue to hold true. NetSquared's Ambassadors are responsible for almost all of the network's growth over the last year. These deeply engaged volunteers ensure NetSquared can continue to build the global #Tech4Good community. The first ever NetSquared Ambassador’s Event for East Africa was held April 2015. How are organizations leveraging mobile for communications, outreach and more? What are the best practices for creating mobile responsive websites? When does it make sense for organizations to create a mobile app? When should organizations design a mobile site on the side if they don't have money for a full redesign? NetSquared DC invited several local experts to participate in its recent panel. Here are their slides! 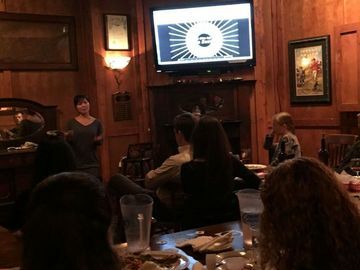 Thank you for everyone who attended the NetSquared Houston Meet Up last week. Here is a recap of what you missed! "What has inspired you so far in 2015?"